Thu., Aug. 2, 2018, 4 a.m.
Time was, online meal-kit companies like Blue Apron were going to either revolutionize the food industry, taking on both grocery stores and restaurants – or go bankrupt because of the cost and complexity of shipping fresh meat and produce to customers’ front doors. But now a third option is emerging: meal kits, made by Blue Apron and other industry pioneers, but sold in grocery stores instead of online. That’s where Newport Beach investment firm True Food Innovations sees the industry headed, which is why it announced last week it has acquired the assets of El Segundo meal-kit company Chef’d, which abruptly shut down two weeks ago. True Food Innovations, run by food and real estate investor Alan True, plans to use the Chef’d brand name as part of a broader plan to become a big player in the in-store meal-kit business. Meal kits, which include premeasured portions of ingredients and instructions for making particular dishes – anything from summer vegetable risotto to maple pork chops with green beans – have become increasingly popular since online firms started offering them around 2012. New York-based Blue Apron and Berlin’s Hello Fresh are market leaders, and combined they sold about $1.5 billion worth of meal kits online last year, up from about $1.1 billion in 2016. But grocery stores, including Walmart and Fred Meyer parent Kroger are getting in on the meal-kit game, too. Last year, brick-and-mortar grocers sold about $155 million worth of meal kits, up 26 percent from a year earlier, according to market research firm Nielsen. That increase came despite an overall decline in brick-and-mortar stores’ grocery sales. Meghan Guattery, a retail analyst at research firm Ibisworld, said there’s more room for in-store kit sales to grow. Blue Apron, Hello Fresh and others focus on subscription services, getting customers to commit to a set number of meal kits each week. But for people who want something for dinner tonight, having to order in advance and wait for a shipment doesn’t work. That’s where brick-and-mortar stores come in, Guattery said. Still, the company’s grocery business was a bright spot. Chef’d was the top-selling brand of in-store meal kits, and they were available at more than 1,000 brick-and-mortar stores – including Costco, Stater Bros., Gelsons and Walgreens locations – said Robert Jones, a former Chef’d executive who joined True Food Innovations last year. True Food Innovations bought the Chef’d assets from the defunct company’s lender, which was not identified. In the long term, Jones said he thinks the meal-kit business will be dominated by in-store sales and companies focusing only on online sales and home delivery will struggle. It’s much more difficult and expensive to ship fresh meat and produce to individual customers than to grocery stores that serve as local distribution hubs, he said. Instead of shipping meal kits to individual customers, he said, meal-kit companies can sell kits to grocery stores. Then customers can buy the kits in person or order them through the grocery stores’ own pickup or delivery services or through third-party delivery services such as Instacart. Still, the meal-kit business is increasingly competitive. Like Chef’d, other meal-kit companies are getting into in-store sales. Blue Apron began selling its kits at Costco in May, and the company has said it plans to sell through additional retailers as well. 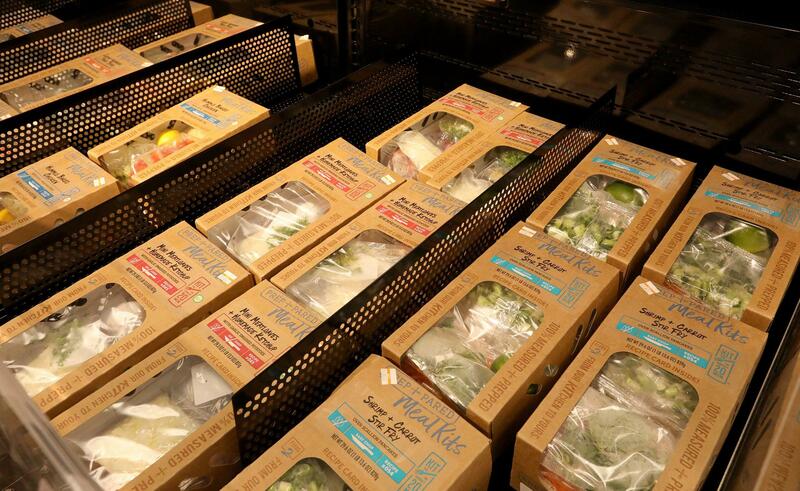 Hello Fresh started selling its kits through nearly 600 Stop & Shop and Giant Food stores on the East Coast last month. Meanwhile, grocery chains – including Walmart and Kroger – are offering meal kits of their own. True Food Innovations’ parent company, True Family Enterprises, already owns a meal-kit company, True Chef, which sells exclusively through grocery stores. This year, the company started selling kits at some Costco stores and through Arizona grocery chain Bashas’. Jones said the kits will be sold through 20 additional retailers starting in September. True Family Enterprises plans to keep making both Chef’d and True Chef-branded meal kits. It also makes kits for other brands, including in-house grocery store brands. Jones would not disclose financial terms of the Chef’d asset acquisition. True Family Enterprises also owns True Fresh HPP, a Buena Park company that specializes in high-pressure processing, which extends fresh food’s shelf life by using immense pressure to kill bacteria and viruses in the food. Jones said the technology makes it easier to distribute meal kits to grocery stores nationwide. All Chef’d employees were laid off last week, before the company’s assets were sold. Those workers won’t be rehired, though Jones said True’s businesses might hire additional workers as they expand. Published: Aug. 2, 2018, 4 a.m.